When I was a wee lassie, Christmas was all about the presents for me. Selfish, I know. Perhaps even Grinch-like. Yes, I got gifts for others, but only to merit something from them in return. Times have changed, and while I still enjoy receiving a thoughtful present, I also find a lot of satisfaction in picking out just the right thing to give someone else. You've no doubt recently become familiar with Tate's Bake Shop, as they've wisely been enlisting bloggers to review their goodies and host giveaways. (That has to be one of the best marketing strategies ever.) I was lucky enough to be contacted by the company and given the chance to sample my own batch and spread the love. The package that I received contained three types of cookies (chocolate chip, white chocolate macadamia nut, and oatmeal raisin), as well as the Tate's Bake Shop Cookbook by Kathleen King. I won't lie--I ate the cookies before I could take pictures of them, but if you're curious, you can see Emily's shots on her site. They were the polar opposite of cakey--all very crisp, yet with a nice chew and the welcome taste of caramel. Very delicious indeed. The cookbook is full of interesting recipes, and I decided to make one in an effort to validate Tate's. I picked the GORP cookies, named using an acronym with which I was unfamiliar until Rachael Ray used it on her show. (It's true.) Good ol' raisins and peanuts. Well, I changed it up a bit, using pecans as my 'P.' The recipe is good--it turns out a delightfully chewy and flavorful batch of cookies. So. Who'd like to win their very own cookies? One fortunate (United States) reader will win a Tate's Bake Shop cookbook and a six-box cookie sampler pack. Huzzah! To enter the giveaway, just tell me one thing you'd like to receive for Christmas. Be as selfish as you want--we're all friends here! To double your chances, become a fan of Tate's Bake Shop on Facebook, and after doing so, leave another comment telling me that you did. I'll close the comments a week from today, Monday, December 6th, and the randomly-selected winner will be announced shortly thereafter. Good luck! 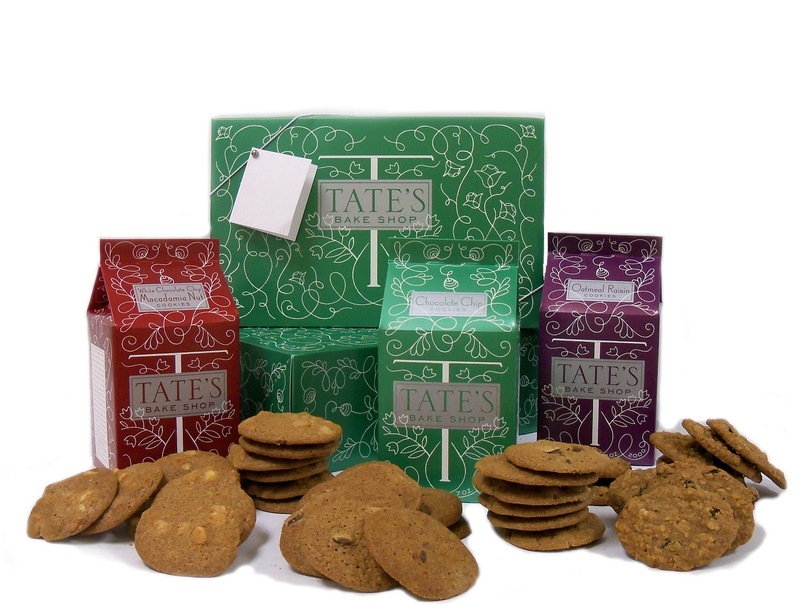 Bonus for everyone--use the discount code cookie to get 15% off at Tate’s Bake Shop’s online store from now until Dec. 31, 2010. Preheat oven to 350°F; grease two cookie sheets or line them with Silpat. In a bowl, mix the flour, salt, baking soda, and cinnamon. In a bigger bowl, cream the butter and sugars; beat in the egg. Add in the vanilla and water; mix together until they are just combined. Add in the flour mixture and oatmeal; mix until combined. Add in the cinnamon chips, pecans, and raisins; mix until combined. Drop 1/4 cup dough onto baking sheets and press the cookies down lightly. Bake for 15-17 minutes; remove the cookies and cool them on a wire rack. Gorgeous cookies and lovely giveaway! I have to make my Tate's recipe this week! I'm still thoroughly undecided about what to make. It all looks so good! I ate ALMOST all of my cookies and still haven't photographed them. Maybe today will be the day! The GORP cookies sound delicious. Hmmm...I will definitely have to make them at some point. What a wonderful giveaway! I always wish the cook books or kitchen related gadgets for the X'mas. The cookies look so GOOD! And I love the oats and cinnamon chips! You had me at pecans. This holiday, I'd like two weeks of germ-free children. Please, Santa? I can't wait for mine to arrive Grace!!! I like a loaded cookie like the gorp, and the pecan switch sounds great! My Christmas list is always a mile long, but one item I really want is a popover pan. I don't know how I've gone so long with out one, but it's time to fix that! Love your GORP cookies, Grace! Pecans for peanuts is a brilliant swap. :) Thanks for hosting this giveaway! One thing I want for Christmas is a new Dutch oven! This year I've decided I NEED a new mixer. But not just any mixer, the 6 qt Kitchenaid that costs half a bajillion dollars. Those look great. I like your pecan substiution...I think it's an improvement! 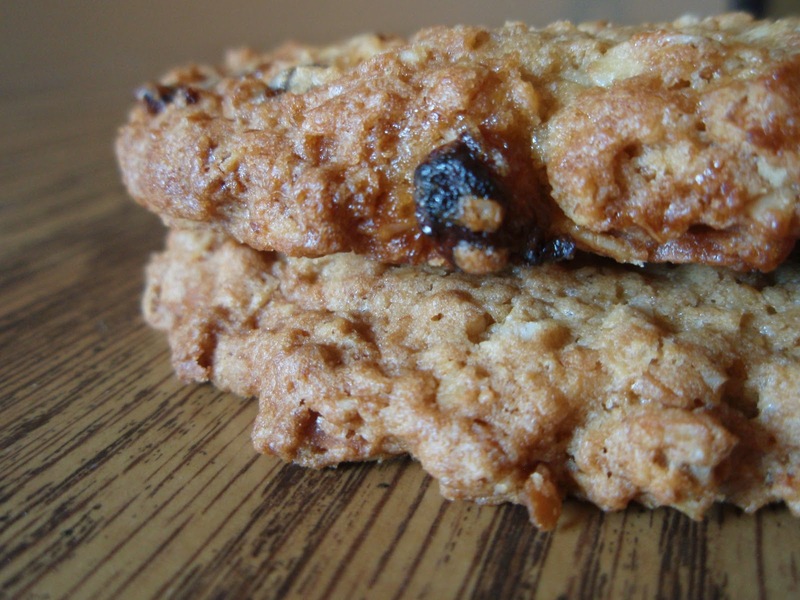 These look so fat and delicious, just my type of oatmeal cookie. I have many cooking items on my wish list this year, but one thing I didn't even bother asking for is a Kitchenaid stand mixer... Maybe Santa will still hear my silent prayers. For Christmas I want a puppy! But first I need to rebuild one side of our fence. Boo. Cookies would be a great substitute! What I want for Christmas, you said I could be selfish, is a cruise to Alaska. Hmmm...seriously? I just want to be with my family! It may be chiche, but it's the truth. These are scrumptious looking cookies for sure! Great giveaway too! I didn't know what GORP meant either, so thanks for enlightening me :). These look great and what a fantastic giveaway. Happy holidays! I am wishing for a laptop! Spendy but much needed and a good investment. I'd love to be able to wiggle my nose and totally bypass the 23 hour drive to GA and be able to spend Christmas with my family. I'm wishing for a marble rolling pin. I've also got dvds from the Gilmore Girls or CSI. As silly as it sounds, I would like a cuddly little puppy! I just learned about Tate's Cookies and became an FB fan. The Gorp Cookies sound wonderful! I am really gunning for some cheap tiles that I can line my oven with to make pizza at home. And can I say, yeah, this is probably the best marketing strategy ever! Yum, cookies to try and give away! Fun give away. I will be totally selfish for Christmas...I just want time with my husband and kids. I would like the large Le Creuset french oven in cassis. i am a fan of tate's on facebook! I want an ipod classic! and rain boots from Target - the ones with roses. For Christmas all I want is to win the lottery with enough to pay off my bills that have accured since my husband was laid off and to pack up and move to be closer to my baby sister. Family is good but my sister is the best!! Oh- an I am already a fan of Tate's on facebook!! Thank you to our lovely clients who bring us their yummies!!! I am really wanting a pair of Ugg boots for Christmas. I want a cast-iron pan. My life will be better when I can take things from stovetop to the oven. Thanks for running this contest! I am a Tate's fan on Facebook! These look delicious and are going on the list to try (with the pecans of course!). I really have everything I need so just some time off to spend with family, friends and my new kitten would be the best thing. Super giveaway...I'd like to try those cookies! For Christmas I'd like some sort of cool phone like an iPhone 4 with all the bells and whistles. Not happening, but I'm okay with that. For Christmas this year I would really like an Amazon Kindle. I'm a fan of Tate's on Facebook! Would love a new KitchenAid foodprocessor for Christmas. I'm a big fan of Tate's and I am a fan of Kathleen's on facebook. A new Kindle. Even the though I have to old Kindle. I am all about the newest and bestest, marketers love me. All I want for Christmas is a couple of lenses for my new Pentax. And maybe some really cute shoes. And a batch of GORP cookies. The thing I would most like for Christmas is for all my family to be safe, happy, and healthy. Would love to get a Canon S95! shukra liked Tate's Bake Shop on FB! If we're truly being selfish here and not saving the world and motherhood, I confess I'd like an iPhone. My Palm is dying. The cookies look yummy, Grace! I'd like to get cookbooks for Christmas! I'd love to get a KitchenAid stand mixer! Delicious looking cookies! One thing that I really want for christmas is an actual working rolling pin. :) All I have is a little rinky-dink tiny pizza-dough one. those sound like some pretty good cookies! I vote for the pecans too! why the heck haven't I heard of Tate's cookies yet? they sound delicious! Bring on the dutch oven baby. I'm already a fan! Hooray! I would love to get a genuine Coach handbag for Christmas. I love the purple one I saw at the mall. I would like world peace... You did say to dream big Grace. Materialistically, I would like a state of the art sewing machine. I did not know about that GORP factoid. Mind blowing as I have all these strange tidbits of info in my head... like running your fingers on stainless steel to get rid of garlic smell. For starters I would love this prize...but really the only thing I really want for Christmas is not for me but for everyone who has a loved one in the Military. I want this war to be done and all Military to be home for the Holidays. all i want for christmas is another job to help pay the bills..
mmm, cinnamon oatmeal cookies are the best and that acronym just made my day. Hmmm, I think I'd like some new kitchen gadgets, stuff I've never heard of!! I love gadgets! I guess what I really want is a new dishwasher. Ours has been broken since March. That and a pair of fuzzy slippers I tried on at Target today. p.s. I'm already a fan of Tate's! Sadly I am not eligible to win cookies, but I can try making them :) Good luck everyone else! There are so many talented bakers out there that I havent heard from! These cookies look so sweet and gratifying! Of of the much needed items on my Christmas list this year is a new recipe book for me to store all my finds and favorites in! My old one is falling apart and has pages hanging out from using it so often! The one thing I have wanted for a very long time is a telescope. I have hinted so many times but nobody gets it! Oh well. I could console myself with cookies. Nice giveaway. Yum. 'wee lassie' is a very Scottish turn of phrase Grace! I'd love some new awesome boots. My husband however wanted to buy me curtains. I too need to make my Tate's recipe this week... maybe today. I loved the cookies too - so buttery and rich. YUM. I am loving the gorp cookies... a bit of everything in them. I asked for a new gas range to replace my old electric . . . and I'm getting it!! I will have to bake some cookies in it when it comes! I would love to get a new laptop for Christmas. FB fan of Tate's BakeShop. Replacing the peanuts by pecans was a fabulous idea...as well as sharing this very tasty cookie recipe. I would love to have a new camera for Christmas. What a delicious giveaway! I would love to have a horse farm for Christmas, and I would like it to be full of adorable Clydesdale foals. Oh and the horse farm will have a great big Southern Plantation style home on the property with a large kitchen full of natural light. I'm a fan of Tate's on Facebook. Yum. Those cookies look very enticing! I've never heard of Tate, but I can see why so many people love 'em. Great looking cookies girl... and yay for the giveaway!!! I want want want a nice business card case for my purse!! And I "liked" Tate's on FB. Hope I win! I know I won't be getting my Christmas wish because I want a new camera - a $2500 camera!! I do want a new dslr camera but that aint happenin.... so on the more realistic side of things, I want house and kitchen items, and some cookbooks. For Christmas I want a ton of cookware--a full Le Creuset set, an All Clad roasting pan, a Shun rocking knife! I have $3000 of items in my fantasy Williams Sonoma cart and I can't afford any of it! Maybe the Christmas fairy will come along. I am a fan of Tate's on facebook now! I'm with you - I love picking out just the perfect gift for someone else, and along the same lines, I'm always a wee bit disappointed in my family members who ask for a wishlist right away without even trying to think about what someone else might want. Oh well! If I get to be selfish, I'll say this: I had not much on Hanukkah list till I just flipped through the Pier 1 holiday catalog and decided I wanted almost everything! won't be anything for christmas this year so it is better not to "wish" for anything. I would love a new laptop - ours is on its last leg! I'd like my week vacation over the holiday to be work-free! I seem to always have something pressing to do and want to finally really relax over the holidays! I want to see my family for Christmas. I live far away from them now and only get to see them once a year. Great giveaway! At the top of my list this year is a Silhouette craft machine, but I don't know if Santa's going to be able to bring me one this year. I'm a fan of Tate's on FB!! Probably weird and wrong that I'd like a Shark Steam n Vac...boo..when did I get all domestic and want to clean all the time! it's never too early for hot sauce! i'm here to pump(kin)...you up!